Does displacement necessarily have to follow gentrification of long-distressed neighborhoods? Can we intentionally prevent that domino effect from happening when new investments are made in communities seeking renewal? And if we can prevent displacement, what do those practices look like? As leader of Groundwork USA’s Brownfields Technical Assistance program, funded by the US EPA to ensure equitable development and environmental justice outcomes in communities wrestling with the post-industrial legacies of contamination, vacancy, and disinvestment, I’m frequently asked some version of these questions. Now, as our team rolls out its latest white paper, I believe I have some cogent answers. In places that have faced decades of decline and isolation, brownfield cleanup and land revitalization has long been recognized as an open invitation to outsiders to come in and invest. Unfortunately, in the process, such investments have led to displacement of longstanding residents, along with their norms and their cultural identities. Whole communities have been torn apart by the free market forces that perpetuate speculation and promote large-scale relocation of existing residents to the next cheapest neighborhood. Though this troubling dynamic has threatened to become the new normal in former manufacturing communities across our nation as they struggle to revitalize, at Groundwork USA, we are working hard to identify practical strategies for realizing more inclusive community renewal. While policy change at local, regional, and national levels must be part of any solution, in our new white paper, we assert that a highly tangible place to start preventing displacement lays with Groundwork practitioners, other likeminded community builders, and the people with whom they work. Yes, nonprofit organizations that design, manage, and fundraise for youth and workforce development programming have an incredibly important role to play in disrupting these destructive “gentrification, then displacement” patterns, and in creating new, resilience-promoting pathways forward. How can we invest in people alongside investments made in places? How can we intentionally invest in individuals and their families to counteract and prevail above the trauma and grief associated with living in poverty and the systemic forces that perpetuate concentrated, generational poverty and neighborhood decline? How can we intentionally invest in the personal resilience and well-being of longtime community residents so they can remain in place and live in the kind of attractive, well-appointed neighborhood that should be accessible to everyone? 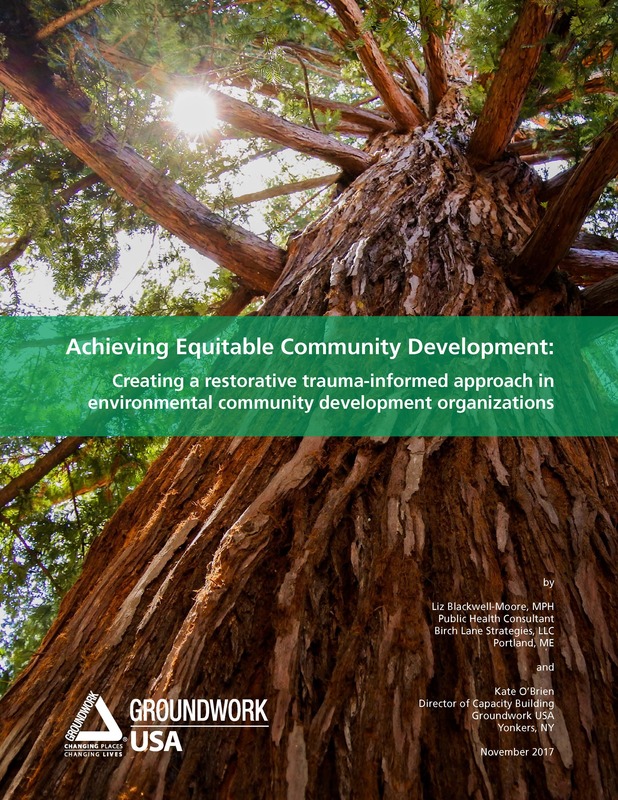 Our working group’s answers to these questions helped us articulate the approach to equitable community development that we present in Groundwork USA’s new white paper, Achieving Equitable Community Development: Creating a restorative trauma-informed approach in environmental community development organizations. By looking at community development work through the lenses of many disciplines, including social work, public health, ecology, community development, psychology, sociology, racial equity, and restorative justice, we assert a paradigm that centers a nonprofit organization’s policies, practices, professional development, and program design and delivery around the person who steps into that nonprofit’s youth or workforce development program, their lived experience, and their capacity to thrive in spite of challenge. Over time, we hope this paradigm shift in the nonprofit sector will push larger youth and workforce development institutions—such as municipal and state workforce investment boards—to shift their policies, practices, and programs as well. We recognize that some practitioners may experience discomfort when reading this white paper. To be sure, acknowledging trauma and adverse childhood experiences (ACEs) of any kind can be challenging for the heart and mind. And asserting this paradigm might strike some readers as determinist thinking about the future of those who experience trauma or ACEs. But our characterization of the lived experience of a person in a low-income neighborhood or a community of color within a long-challenged brownfield-affected area as “traumatic” or “adverse” is not meant to label or stigmatize. Rather, using the lens of restorative trauma-informed practices helps us honor the gravity of the conditions that individuals and communities are enduring, and also what practitioners are encountering in our work to eliminate disparity. It equips us to understand, communicate about, and ultimately rise to the challenge of disrupting the status quo and creating real access to opportunities for building wealth, owning a home, establishing a fulfilling career, cultivating community, and raising a thriving family. This is what equitable and inclusive community development can and should look like. If you’re interested in learning how to integrate restorative, trauma-informed practices into your organization’s policies, practices, and programming; hosting a workshop on this subject in your community; or would like support in assessing where and how to get started, please visit our website to submit a technical assistance request. Our Brownfields and Equitable Development TA team is here to help!